"I just think they're picking nits"
If your neighbor wanted to paint his home a bluish-green would you mind? Probably not, unless you're the Townewest Homeowners' Association. 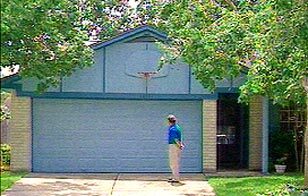 HOUSTON (KHOU) -- If your neighbor wanted to paint his home a bluish-green would you mind? Probably not, unless you're the Townewest Homeowners' Association. In that northeast Fort Bend County neighborhood is a one-story home in the 10,000 block of Gulfstream Lane that is at the center of a color controversy. the house look a bit more cheery,"
had more bright colors in the neighborhood, it would add to the attractiveness." But the aquamarine blue he loves somuch has the Townewest Homeowners' Association seeing red. Last week Van House received a letter from the association's management company. It stated his house color didn't comply with neighborhood code. And that he had 15 days to explain how he would solve the problem or request a hearing. Van House says he slapped on the paint in 1990. Back then the homeowners' association gave it the okay. "When it gets down to house color, especially one that's been around for 12 years like this one, I just think they're picking nits," said Van House. Van House and his wife wonder why their homeowners' association is so worried about their home, when they feel there's something else it should be more concerned about. But she said that the homeowners' association has refused to do anything. They decided instead to force the Van Houses to choose between freedom and foreclosure. Neither the Townewest Homeowner's Association nor their management company would comment. Legal experts say homeowners are bound by neighborhood deed restrictions. But since a previous association said the color was all right, the Van Houses could have a strong case.